The Eiffel Tower was constructed between 1887 and 1889. What do the French call it? Le Tour Eiffel, pronounced le toor eff-ell. Of what is the Eiffel Tower composed? 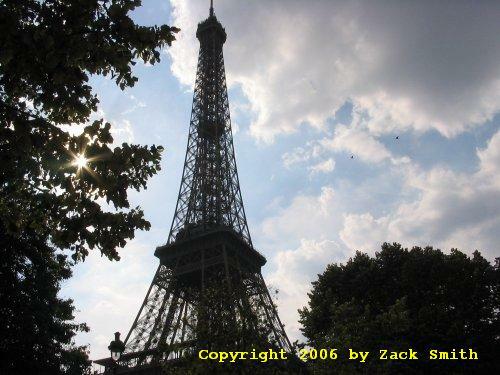 The Eiffel Tower is just south of the Seine river, which flows northward through Paris. It is in the 7th Arrondissement (district). It is on a field called the Champ de Mars (field of the god Mars). It was constructed for a World's Fair that was called the Exposition Universelle, which commemorated the anniversary of the French Revolution. 300 meters or about 915 feet. The antenna is 24 meters high. Is there a radio transmitter? Yes. Both FM radio and analog television signals are transmitted from the top of the Eiffel Tower. What keeps the legs from splaying outward? There are cables under the ground that tie the legs together. Is there a secret bunker under the Tower? There is a bunker, but it's not so secret anymore. He was a French engineer from a family of German immigrants. His family chose the name Eiffel after emigration to France because the French were having trouble with the family's original name, Boenickshausen. Eiffel comes from the river Eifel, which flows past the family's original hometown. Yes. The Tokyo Tower is the best known to be inspired by the Eiffel Tower and looks similar. It is 332.5 meters tall. A rather useless near copy of the Eiffel Tower as well as Parisian apartment buildings were constructed in what is now a ghost city in Tianducheng, China. There are numerous smaller Eiffel Tower replicas.